Provide your clients with pigmentation, Toning, carbon peeling, vascular treatments & more. Utilize larger spot sizes, faster firing speeds up to 10 Hz, And greater power with up to a 2-10 mm circle spot size. Ultra short pulse duration of 6000 picoseconds means less laser tattoo removal treatments. Shorter the pulse duration = faster. Target pigmentation in darker skin tones with fractional HP and utilize PTP mode for energy outputs of up to 2600 MJ. Offer the Latest Non-Ablative Fractional Laser Resurfacing, Tattoo Removal and Laser Skin Rejuvenation Treatments. The MedLase Q2 is an effective, non- invasive laser tattoo removal equipment that can be used to correct the appearance of wrinkles, discoloration, and scars with virtually no downtime. A series of MedLase Q2 treatments can improve the overall look and feel of your skin, leaving you looking healthier, and remove virtually all tattoo colors. With MedLaser USA you get the latest technology for the most affordable price. What is the MedLase Q2 Laser? The MedLase Q2 laser tattoo removal equipment is a Dual-Pulsed Q-switched Nd: YAG PTP Laser designed to even skin tone and texture, soften the appearance of acne scars, correct pigmentation issues & target both light and dark tattoo colors. 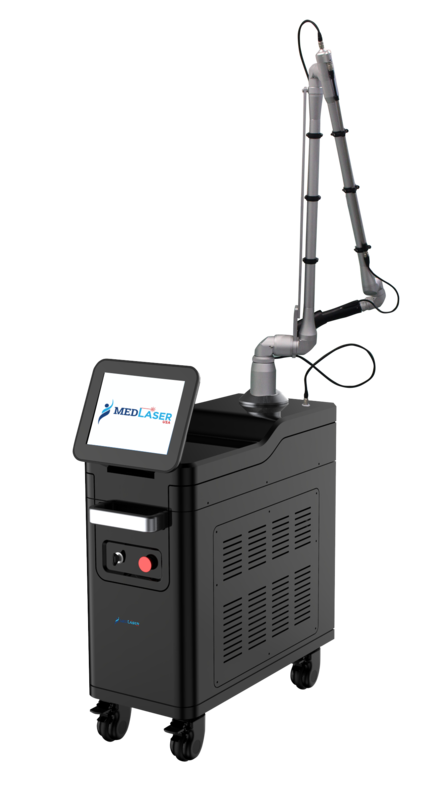 Why The MedLase Q2 Laser Tattoo Removal Equipment For Your Clinic? The MedLase Q2 is an affordable laser tattoo removal equipment. Don't overspend on your laser while getting the same scientific gold standard wavelength technology without spending six figures on your laser. MedLase Q2 has the capabilities to deliver top end energy output without spot size limitations that you will get with other devices. Produce up to 41.4 J/Cm2 @ 1300MJ at single pulse mode, you will never be short on power and spot size options. The MedLase Q2 is perfect for any clinic looking to effectively remove tattoos with a wide range of treatments to grow into. This device comes with a wide range of features from multiple hand pieces allowing you to remove tattoos but also offer your clients non-ablative skin rejuvenation and light facial resurfacing. Typically most clients don't want to experience any social downtime from recovery which is why the MedLase Q2 is perfect for that client looking for results and is able to go out in public. Utilize the skin rejuvenating hand piece or the fractional handpiece to effective fade away fine lines, wrinkles, age spots, uneven skin tones, large pores and more. The latest technological advancement in skin rejuvenation is carbon peeling. Since the MedLase Q2 has both Quasi-Long mode and standard Q-Switch mode you can effective offer the latest skin rejuvenation treatment, carbon peeling. Grow your practice with the MedLase Q2! How Does MedLase Q2 Technology Work? Compared to other treatments of its kind, the MedLase Q2 laser tattoo removal equipment is an extraordinarily gentle and effective laser, featuring virtually no downtime. Patients can receive multiple treatments and achieve dramatic results. Engineered for performance, the MedLase Q2 beam profile and power options ensure energy is delivered efficiently to maximize effect. The MedLase Q2 flat-top beam and combination of high peak power and short pulse width deliver efficient destruction of the target pigmentation. Engineered for performance, the MedLase Q2 beam profile and power options ensure energy is delivered efficiently to maximize effect. The MedLase Q2 flat-top beam and combination of high peak power and short pulse width deliver efficient destruction of the target pigmentation. Laser beam quality is evident to lasers costing six figures. Save money with the MedLase Q2 tattoo removal laser. Anyone interested in of removing unwanted tattoos, correcting melasma, improving the overall quality of their skin, or improving scars! The MedLase Q2 laser is an ideal treatment option and device for every clinic! It is safe enough for use on all skin types, and gentle enough to target sensitive skin. Add the MedLase Q2 to your clinic today!